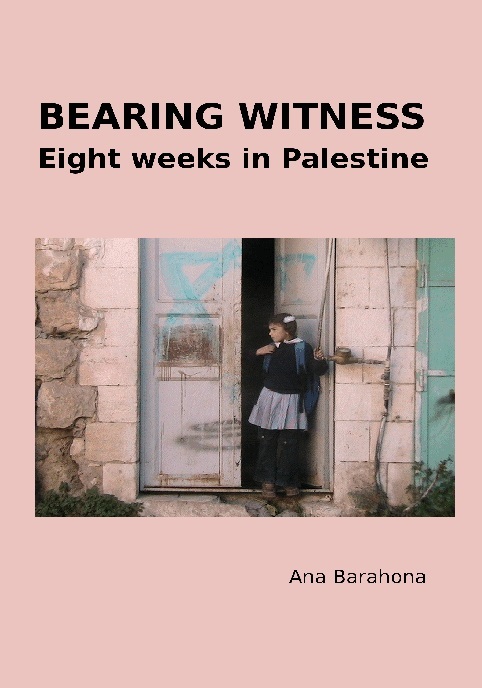 Bearing Witness – Eight Weeks in Palestine by Ana Barahona | ana. This book is part of that telling. You can of course order it from myself: abarahona at riseup.net indicating format and, if physical, printed book, how many copies. You can now read it in goodreads; come back and give whatever donation you think it’s worth! I found myself gripped by the simple, eloquent narrative of this real-life experience in Palestine. […] Ms Barahona speaks purely as an observer, which was the role she took, and the gratitude of the Palestinians is almost painful to read. I was aware of the conflict before, but not the reality of the action on the ground. Now I am. This book is enlightening, enraging and vital to read. Strongly recommended. All the names in the text, including the author’s, have been changed, to try to avoid repressive actions by the State of Israel.